Bryce Harper said before the game Saturday that he had played in bigger games before, and downplayed the significance of Washington’s possibly falling down at home in the NLDS 0-2 to the Chicago Cubs. The Cubs led the game in the 8th inning 3-1, and then the Nationals awoke with one mighty swing from Bryce Harper. 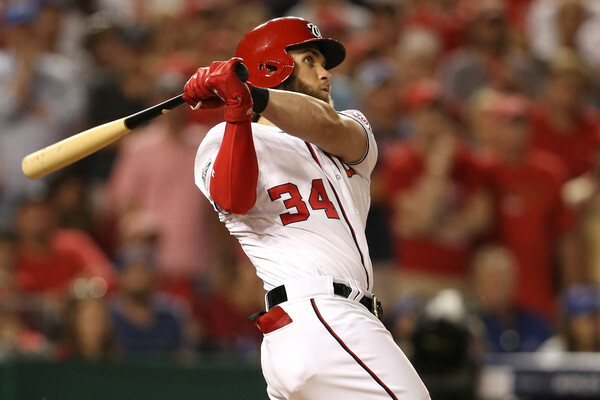 It was undoubtedly the biggest home run of Harper’s career. Carl Edwards made a mistake he may never live down. The Nationals would win it in the bottom of the 9th inning on a home run from Ryan Zimmerman, 6-3. If the Nats would have lost this game heading back to Wrigley needing three in a row against the world champs, there is a decent likelihood that there would be some articles written that this was the end of the current core’s run; having never won a postseason series together. For now at least, Harper plays the hero and keeps the Nationals right in this thing with hopes to knock off the champs and get to the NLCS.